These young guns have taken their best shot, literally, in 2017-18. While they might be short on NHL experience, this heaping handful of rookies is seriously big on talent. Featuring a pair of ties – for third spot and fifth – these rising stars have risen to the challenge and delivered for their respective teams. 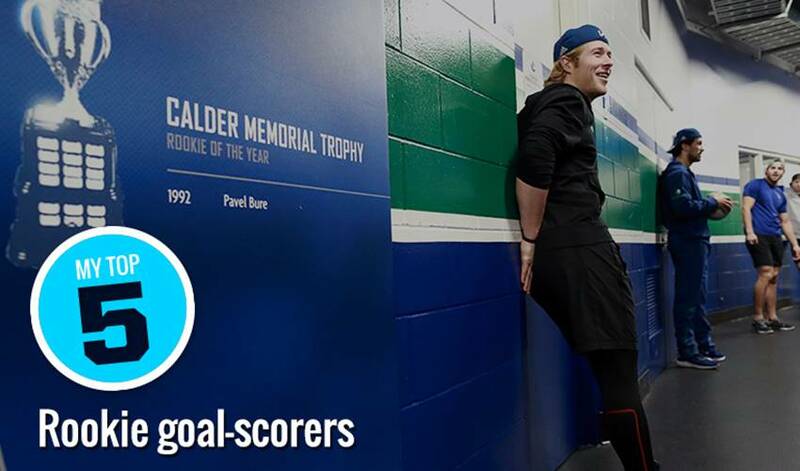 Which rookie will net the most goals this season? Here’s a look at which Players are leading the way so far. Selected 23rd overall by the Vancouver Canucks in 2015, the Minnesota native has been the toast of the Canadian west coast, racking up 20 goals in 2017-18. The 20-year-old right-winger has six power-play tallies and four game-winning markers. The seventh overall selection of the Arizona Coyotes in 2016, Keller has been a lamp-lighting machine for the Western Conference squad. In 38 games, the Missouri native has three power-play goals and one game-winning tally, while averaging 18:50 of ice time. What’s a nice way to head into the Christmas break? For Barzal, who patrols centre for the New York Islanders, it was four goals in two games, including a hat trick (on four shots) against Winnipeg on December 23. The 5-foot-7, 165-pounder has been a heavyweight contributor to the Chicago Blackhawks in 2017-18. Hailing from Michigan, DeBrincat, the 39th overall pick in 2016, has notched two power-play goals for the Original Six club. At 26, Gourde is finally getting a shot at full-time NHL duty – and he’s certainly making the most of it. After playing in 298 games in the American Hockey League, the pride of Saint-Narcisse, Quebec is bringing the thunder to the Tampa Bay Lighting, including three power-play goals, one short-handed marker and one game-winning tally. The 29th overall pick of the Los Angeles Kings in 2014, Kempe has already contributed three game-winning goals in 2017-18. On October 18, the native of Sweden registered his first NHL hat trick in a 5-1 triumph over the Montreal Canadiens. The 21-year-old winger, drafted in the first round by Winnipeg in 2015, has posted 10 goals as part of his 20-point campaign so far for the Jets. He scored a pair for his first multi-goal NHL career game against the Vegas Golden Knights Dec. 1. Vrana was selected in 2014 by the Washington Capitals in the first round. The Czech forward scored in back-to-back games earlier this month against the Colorado Avalanche and Boston Bruins, respectively, Dec. 12 and 14, and has also picked up two game-winning goals as part of 16 points over the course of the 2017-18 season so far. Bratt is part of a New Jersey Devils squad that's on a roll right now, having won their last four consecutive games. The 19-year-old winger was plucked in the sixth round in 2016 by his current club and has five multi-point games as part of 23 points so far in his 2017-18 campaign. With summer coming to an end, the hockey season is just around the corner and for some NHL rookies, they remain eager to build on a strong first impression made at the end of the 2016-17 season.